It’s that time again folks! It seems we are finally moving away from the summer lulls. Speculators, vendors, and all those in between are starting to notice cards that they believe are undervalued. 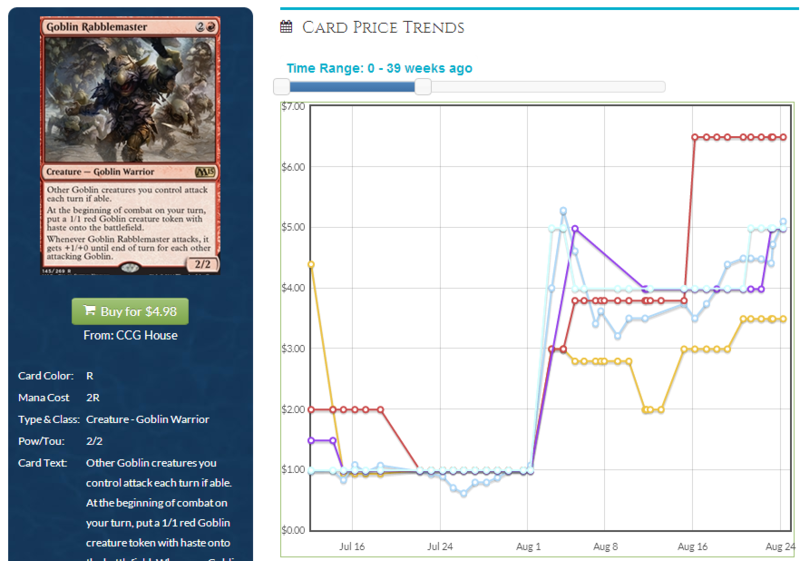 The evidence as usual is the upward trend in price and downward trend in inventory on TCGPlayer and other large vendor websites for certain cards. The question is though – is it hype or is it a spike? I’ll identify some cards I have noticed so far and give my justification one way or another. We’ve seen this song and dance in the past so hopefully some cards will be much more clear cut than others. I’ll also mention some other cards in the latter half of this article that people seem to be talking about online. These aren’t cards that are going to move significantly in price one way or another overnight but I thought I would address them since various sources have been discussing them. On Friday of last week a buy out was executed on Maralen. Why, you ask? I’m asking myself the same question. I’m guessing this acquisition was based on the fact that she is a legendary creature from a small opened set, without a reprint in a supplementary product, and is the general of a pretty infamous Commander deck based on around Tendrils of Agony. That’s right folks, if you ever wanted to play ANT in Commander and be “that guy” then this general is perfect for you. The problem is, I don’t think Commander players are very thrilled with losing on potentially turn two or three on a regular basis. Of course, if you have a very cutthroat Commander group then I can see this being the case – your metagame will just pack a bunch of targeted discard or other outlets. Yet to bring this kind of a deck to a Commander group that doesn’t play single person targeted discard or a ton of cheap counterspells? That’s just plain rude. Another issue is that this card sees no competitive play. At all. Letting your opponent Grim Tutor during their upkeep seems bad. I know the argument “dies to removal” is a pretty bland argument against using a card but in this case it makes sense especially since you can tutor up any removal spell you want to get rid of it. All in all, stay far away from non-foil versions of this card until the hype dies down. This isn’t going to be doing anything in Modern, at least not yet. They would have to print something similar to Mindlock Orb that is easy to synergize with Maralen. Foils on the other hand could be profitable if you can get them for the right price. Being a cutthroat general is actually a bonus for competitive Commander staples since these players are the types of folks that like to foil out their decks. As of Friday, there were only two foils listed at $40 and $50 on TCGPlayer. I don’t think this is too far off from the real foil value and it can only gain over time. If you can find foils close to $30 I think that could be a pretty good deal. So much for Burn being a cheap option for Modern, eh? Guess it was good while it lasted. He has been slowly trending upwards over the past few months and as of last week is now hovering around $24. One major factor for this increase is the Modern viability of the card. Burn is a deck many players favor for getting introduced to the Modern format. This way you can play Modern but also use the prize winnings to slowly work your way up to decks like Pod, Jund, and UWR control that have lots of shocklands and fetchlands and are decks that have better matchups against a wider range of the field. However, I also think that the SCG Legacy Invitational in Somerset that is coming up at the end of August has something to do with the recent increase. I think that vendors are predicting that more players are going to want to start getting into Legacy especially with the Legacy GP coming up in November. Burn and and UR delver currently make up about 6% of the Legacy metagame. This is significant for a format like Legacy which tends to have 15+ solid Tier 1 decks that have a decent shot of taking down a tournament or making Top 8. Vendors noticed this and acted accordingly, buying up any copies of Goblin Guide they could since June and and reselling them at higher prices until now. There were good reasons for this spike and in a way it could be predicted based on the trend from the previous few months if you happened to notice it. I’m not sure if it was on player’s radars though because there is also a GP promo (which also spiked) and Goblin Guide was reprinted in a Mirrodin Besieged event deck with two copies per deck! There are plenty of copies out there but demand has now come to outpace supply. This card has corrected in price and will not be moving without another reprint for some time. Speaking of goblins, at Pro Tour M15 Rabblemaster was the talk of the town. It spurned enough interest from players and vendors alike to make it jump from around $1 retail to $4 retail where is still hovers on TCGPlayer. I think there is both hype and demand factors for the spike. He didn’t get anyone into the Top 8 of the Pro Tour but it did get two people into the Top 32. Clearly there is potential in him being played in aggressive red decks upon rotation of Return to Ravnica block. The question now is can it stay at $4 or possibly even go higher in the fall? I’m not sure if the buy in now is going to enable you to make any significant profits in the future. He would need to go up to $8+ in the future to see any type of net profit and I’m not willing to take that risk. Pick them up if you plan to play them however don’t expect to make killer profits off this guy at $4. Only if his price drops down going into September to $2 or lower would I look to buy in. I think he will see a fair amount of play after rotation. Just keep in mind that the shelf life is usually pretty short on these highly aggressive cards so I would look to get out once the control decks become established. 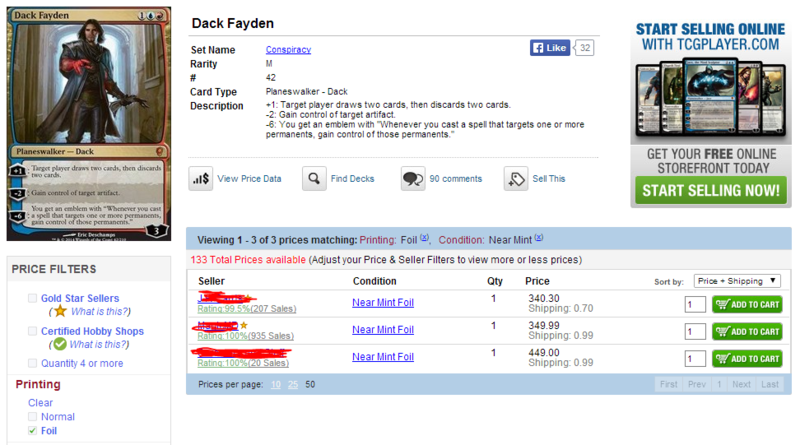 While the non-foil versions of Dack have dropped significantly since the release of Conspiracy, from the crazy preorder prices of $50+ to the now average $19 on TCGPlayer, his foil version on the other hand is a completely different story. MTGPrice is still lagging a bit on the new foil price with no clear listings from any of the vendors so I will provide this screenshot from TCGPlayer. Only three foil listings at $350 and $450 respectively! 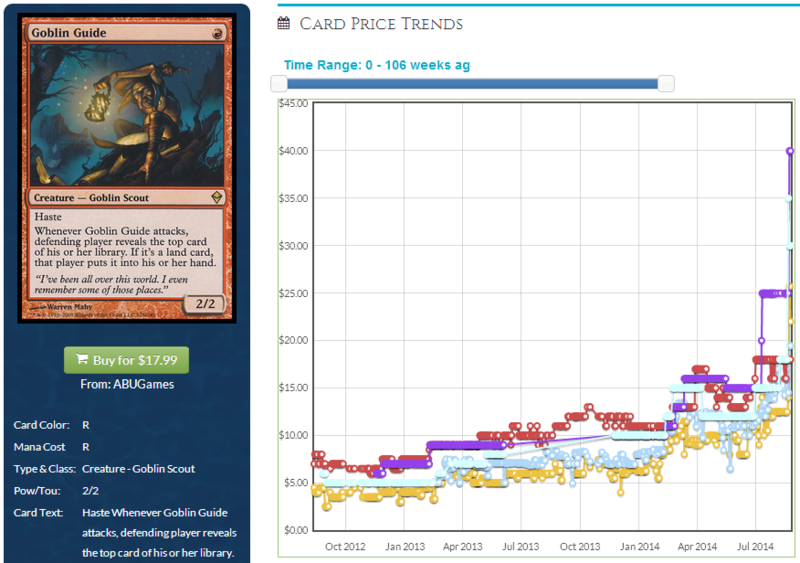 That is a huge jump in foil price in only just a few months from the Conspiracy set release. For a while, you could have gotten yourself a nice shiny Dack for around $130. Looks like that turned out to be a bargain. A Japanese foil Dack sold for $500 (to be expected) but other than this outlier the rest have been ending around the $165-$175 range on average. Once lucky guy got one for $140. 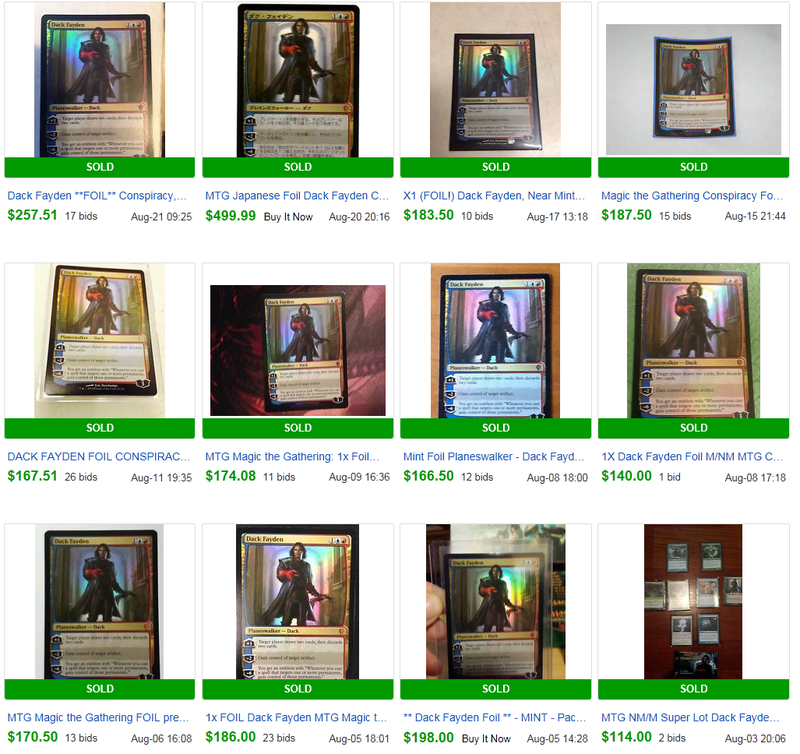 Even though these are completed listings, many of the BIN’s on eBay are being listed at $350+. I don’t believe there was a particular run on foil Dack and that this is actual demand yet there is still some hype to the price. He has real eternal format playability especially in Vintage where foiling out your deck is the norm for many players. He hasn’t made an impact in Legacy yet the potential is always there. He is a Cube instaclude and a Commander powerhouse. He is even more relevant in Commander now that Wizards is pushing Planeswalkers as generals. Eventually, enough people will house rule walkers as generals and Dack would make a sweet general. 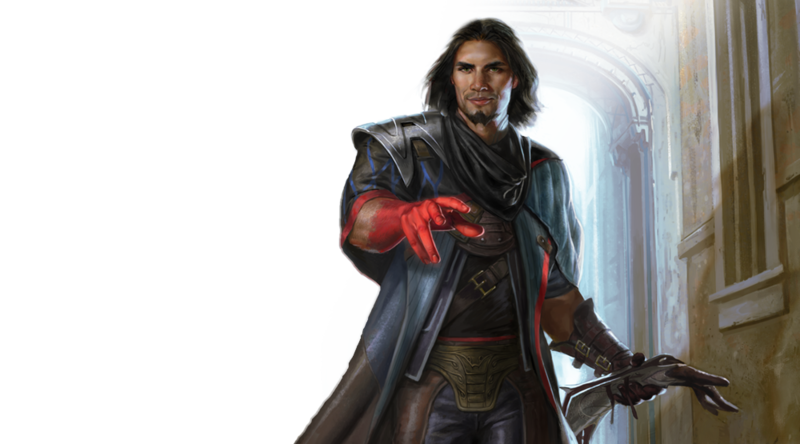 Having a foil Dack as your general is also highly desirable for many Commander players. Now that the price has reached such lofty heights I don’t think it is going to move all that much. I really don’t know what the effect of more Conspiracy being opened is going to have on his foil – I was clearly wrong in my Conspiracy foil analysis* because the demand for foil copies is there and it is apparently very strong for those that want him now without having to bid on eBay. However, should his foil be worth almost as much as a Moat? Probably not. If you can negotiate a good price on a foil I would pick it up but otherwise don’t buy into the current hype. I think there is volatility to the foil price because players won’t be happy seeing his foil has gone over $300 retail and this could force vendors to trend the price downward. He also has a good chance of seeing a judge foil printing once Wizards catches wind of the price, which in turn will increase the amount of foil copies on the market. These two factors make me think this new price is somewhat driven by hype and a low market supply. Going forward, I’m still going to keep in mind that there is justification for a higher price than before the spike (~$130) yet the current price feels too high to me. *Not that this absolves me however I provided my comments on foil Dack before the C15 decks were revealed featuring Teferi as a planeswalker general. This could be another huge factor driving the foil price in addition to the other factors I mentioned. This card has spiked due to Modern demand. It has gone from around $0.30 to $3.50. Do not buy in at this point, there is no profit to be made because it will be hard for this card to sustain a price of $7 or higher for a significant length of time without being included in more decks than it is currently featured in if you do buy at $3-$4. There is also the potential reprint to consider, though the card is so odd they would have to fit it into a MM2 set or similar. If you have any copies you will be able to trade them well though price isn’t moving from $3.50 for quite some time. Is this the cheap man’s Palinchron? It’s gone from bulk status to $3 over the past two weeks or so. I think for $6 more you could have yourself a nice Palinchron and not have to worry about using other cards outside of Caged Sun (or similar) in order to generate infinite mana. I don’t really see a reason why this card is now $3. It’s played in… Commander, maybe? It is on the reserve list so there is that. Other than these two factors, which aren’t all that convincing, there isn’t a ton going for this card. Stay away, far away at this point. I’ve also thought about the prices of some other cards and where they are going in the future. I’m taking into account Standard cards, regularly played eternal cards that will experience reprints, and casual favorites. Ashiok has been slowly trending upwards since his low of $5. This is a casual favorite that seems to sell well and retain a decent price. If you can grab any copies from $7-$8 trade I don’t think you can go wrong. He will always command decent casual appeal for being a mill walker and he could also see Standard play in the future. Many eternal players in Modern and Legacy seem to be including him in lists for UWR in Modern and UWr Miracles in Legacy. I don’t think you can go wrong with foil copies here as they stand to gain the most in the long run. Non-foils could also be a good target if you can trade for them at $6-$7 or pick them up for $5 cash. Both Griselbrand and Lightning Helix have had reprints announced. Griselbrand is scheduled to be the next GP Promo and Lightning Helix is being reprinted in the next duel deck Speed vs. Cunning. Griselbrand has already seen a price slump due to this announcement and I unfortunately don’t think his price is going to go anywhere in a while. Sneak and Show seems to be a Legacy deck that comes and goes these days so I don’t think you can reliably rely on the deck to influence his price much at this point (unless it wins the Legacy GP in November). The buy in price is too high and the gains won’t be that significant over the next several months. Lightning Helix on the other hand isn’t really going to be changing price much, if it all. Is is a very popular uncommon and is used quite heavily in Modern, much more than Griselbrand is used in Legacy. Don’t expect a price drop but also don’t look to acquire more. This reprint is only going to stabilize the current price. Command Tower is around $1 now. It used to be $5 before the C14 reprint yet now that we have mono colored Commander decks coming up Command Tower will not be seeing a reprint this year. $1 is a good buy in price, cash or trade – it will never go below a $1 due to casual appeal and I believe it can only go up from here over the next year. This is definitely a card that needs to be offloaded at the opportune moment since the imminent reprint here is pretty obvious for future Commander products. Next spring though? Wouldn’t be surprised if this was $2 or more. A risk here is that they might be very hard to move unless your area has players that like to build multiple Commander decks. I’ve been seeing some chatter about this card online and it centers around the casual appeal of the card. This card is the upgraded version of Millstone because the more mana you have the more you can mill your opponent. I honestly think that Ashiok is a much better card and I would be hard pressed to buy Sands over Consuming Aberration. However, for $0.50 it seems like a pretty low buy in point. Could this break $2 or $3? It’s from a core set, which means there are fewer copies of it out there then rares from bigger sets like Return to Ravnica or Theros. If you can get these as bulk throw in’s for trades I would certainly consider it. I would say the only reason Millstone is a bulk rare now is because they reprinted it as an uncommon in M14. Before that, I was seeing Millstone sold for $0.50 with regularity. Sands of Delirium seems like a fine pick up if you can get them for $0.50 or cheaper for future gains. Previous PostWeekend Update for 8/23/14Next PostMagic is dead. Long Live Magic.